Love was in the air yesterday as married couples renewed their vows at a Valentine’s Day service in Peterborough. The most romantic day of the year saw couples visit St Paul’s Church in Lincoln Road to re-affirm the commitments they made to each other many years ago. 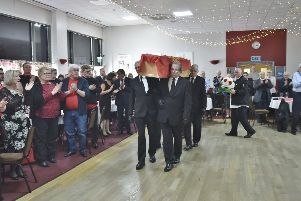 Lovebirds, including Beryl and Keith Buckland who were married in 1973, used the annual ceremony to express their unwavering affection for their partners in the presence of Reverend Ron Watkinson and his wife Val.